Since winning three world titles at Liberec in 2009, Petter Northug has emerged as a potential successor to his great Norwegian compatriot Bjorn Dahlie, the legendary cross-country skier who pulled off the same feat in 1993 at Falun. He will go to his first Olympiad at Vancouver in 2010 confident of winning multiple titles, but he will have to go quite some way yet to emulate Dahlie, who quit the sport with eight gold medals and nine world titles. Born at Levanger on one bank of the Fjord of Trondheim, he grew up at Mosvik on the other bank, where he emerged as a highly gifted junior competitor. He set a new record when he won six combined gold medals at the 2005 and 2006 world junior championships and whilst still competing as a junior, he made his debut on the senior World Cup circuit in March 2005 when he raced in his home country at Drammen. That didn't last long as the following season, he picked up his first victory as part of the Norwegian relay team that triumphed at Falun in Sweden. It was a matter of time before he won his first individual race and it was at Lahti in Finland in March 2007 that he took his first World Cup honours, coming home first in the sprint and going on to finish seventh in the overall rankings. The 2007 campaign was also significant for another reason, his first world title at the championships in Sapporo, where he helped the powerful Norwegian team to the relay gold. He was 21. 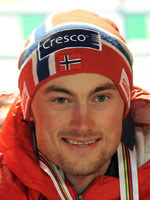 Coached at Tronheim by the quadruple Olympic champion Thomas Alsgaard, Northug continued to progress and hit the top during the 2008-09 season, when he won World Cup events in relay, sprint and long distances. He also shot up the world rankings and finished the campaign second behind Switzerland's Dario Cologna. Northug then hit the jackpot at the 2009 world championships in the Czech Republic, taking gold in the pursuit, relay and prestigious 50km freestyle races. In the relay, he was Norway's anchor man and set off on his 10km leg with a deficit of 15 seconds on Germany's double world champion Axel Teichmann. He caught Teichmann with time to spare before turning in a devastating final kilometre to give victory once again to Norway. The 50km race was equally dramatic as he failed to break away from the leading pack before winning a sprint finish against the surprising Russian Maxim Vylegzhanin and German veteran Tobias Angerer. He is without doubt the strongest finisher on the circuit and this along with his other qualities will make him the outright favourite for cross-country gold at the Vancouver Games in 2010.